What is it about renewal? We need and long for it, desperately, a hunger nothing else can satisfy, though we try to fill it with things rather than with actual transformation. Too often we get cynical when hopes and dreams don’t pan out. I saw a fair amount of this, sadly, in the adolescents I worked with as a high school teacher. Of course, some of it was learned from adults. Renewal and revitalization can seem remote, hard to access. Too often we mock the sentimentalist and the optimist for living in “another world.” Maybe that’s partly because we know deep down that the renewal we need is in this one. In Part One I wrote about the Japanese Shinto practice of Shikinen Sengu, a ceremony that occurs every twenty years, in which the most important shrine in Japan, at Ise Jingu, is ritually rebuilt and renewed. The biggest shrine most of us have is our homes, where we erect a mirror for our lives by our choice of partners, children, pets, clothing, furnishings, beloved objects and spaces. So a ceremony in a foreign country, and one focusing on a foreign spiritual practice on top of that, may seem like a backwards way, to say no more, of getting at anything important or useful to say about living life in 21st century America. But bear with me. When we hear words like ‘globalization’ we may not realize how dramatic the changes have actually been, since we simply live through many of them in some form, often unawares. To give just one local example, the recent decision to close our nuclear plant, Vermont Yankee, was driven by economic forces more than anything else, but among those were the mounting costs of meeting a tightening of regulations by the Nuclear Regulatory Commission, in response to the disaster at the Fukushima nuclear plant in Japan following the tsunami two years ago. Our lives are already linked to those of many others we will never meet. Globalization isn’t a choice, it’s a phenomenon like the seasons — it’s part of living on earth in this era. We’re neighbors already — distances between us collapse to nothing. MENEDEMUS: Chremes, can you spare a moment from your own affairs to listen to someone else’s–even if they don’t really concern you? CHREMES: I’m human, so any human interest is my concern. Call it solicitude or curiosity on my part, whichever you like. If you’re right I’ll copy you, and if you’re wrong I’ll try to make you mend your ways. Shikinen Sengu is a family affair. Occurring as it does every two decades, the ceremony happens three to four times in the average person’s lifespan. Many trees are felled in preparation for each Shikinen Sengu. These logs are carefully selected and then transported to the reconstruction site at Ise, where new life is endowed to the logs. Young trees are carefully planted to replace those fallen in order to perpetuate the forest. The timbers removed when the Shrine is rebuilt are distributed to shrines throughout Japan, where they are reused, particularly to disaster or earthquake-stricken regions. Some of the sacrificial offerings and other contents of the shrine are also distributed among other shrines. Following the 61st Shikinen Sengu, lumber and contents of the Shrine were distributed among 169 shrines throughout Japan. As food, clothing and shelter form the requisites of our life, we have to prepare similar requisites for the kami, if we wish to receive blessings from them. 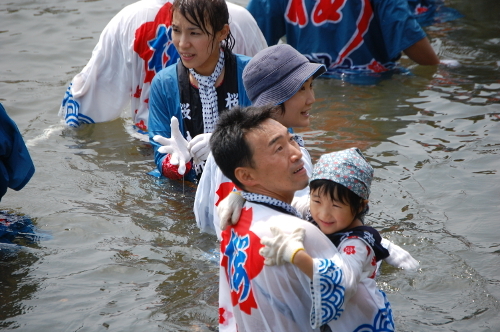 Therefore, the ceremony of the Shikinen Sengu includes the renewal of buildings (shelter) as well as the renewal of the treasures (clothing) and the offering of first fruits (food). By performing the Shikinen Sengu, we renew our minds by remembering that our ancestors had enshrined Amaterasu Omikami in Ise, and praying that the Emperor will live long, and that peace will prevail in Japan and the world. It also involves the wish that Japanese traditional culture should be transmitted to the next generation. The renewal of the buildings and of the treasures has been conducted in the same traditional way ever since the first Shikinen Sengu had been performed 1300 years ago. The scientific development makes manual technology obsolete in some fields. 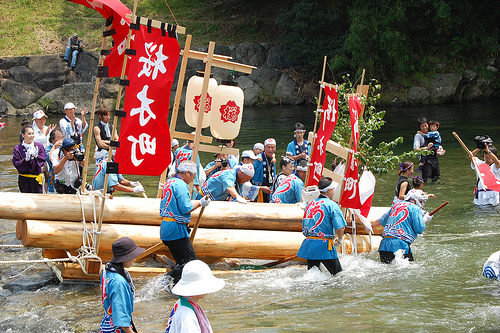 However, by performing the Shikinen Sengu, traditional technologies are preserved. Ritual and ceremony still have important roles to play in keeping us balanced, connected and mindful of our heritage. Even more, ritual and ceremony remind us of our place in this world, as beings who share a planet with so many others. This is one way to understand the Japanese kami or spirit: not so much separate things or “gods” as they are personifications of the profound links we share with the world and the other beings in it. The links exist, and deserve our acknowledgement. Our culture has dispensed with much former ritual, not always to the bettering of our Western lives. We need the connections that ritual can help us form and maintain, and which help nourish and sustain us. Of course, families usually make their own traditions and rituals instinctively, regardless of what the larger culture is doing. It’s the start of football season, and how many families do you know who have special recipes, traditions, gatherings, rites to celebrate their favorite teams and the hours of television ahead? We do ritual because we’re human. The old ceremonies that no longer hold meaning or value need to be updated, renewed, or replaced with others — but not abandoned, any more than we abandon our humanness merely because one way of being human needs refreshing, renewing or transforming. To do otherwise means living stunted, incomplete lives. Images: logs in river; family in river.